I like to play boardgames with my kids. Ususally when we play I have to adapt the rules so it works out to play with both a five and a ten year old. Finding a game that both of them likes and understands isn’t always the simplest thing. So I thought why not make a game myself that both of them would like, a game where I make the rules and don’t need to change them all the time. And of course I can make a game where I need to make a map. Both of them like Pirates so I thought I use that as the theme of the game. First of all I need a board to play on, and a board means a map. Luckily Campaign cartographer 3 has a great treasure map style in the October issue of the 2011 Annual. I wanted the map to be very clear and easy to understand, nothing complicated. The idea of the game is that everyone will have a ship and a home port. On the map there also has to be several locations where you can find treasures, marked with a cross. When you find a treasure you draw a treasure card that reveals how many coins it includes. Of course you can also be unlucky and instead of a treasure the card will reveal a buccaneer and all the treasure you still have on board your ship will be lost. When all the treasures are found the game ends and the pirate with the largest treasure is the winner. I’ve really looked forward to the release of this year’s June Annual that gives you a new drawing style by Herwin Wielink: Isometric Dungeons. The style itself includes some really fantastic graphics and possibilities and it lets you create a new good looking map in no time at all (compared to if you’d do all the graphics by hand). The style itself was a bit tricky to work with for me. Or if you put it another way, the style really showed me how much I still have to learn to completely master Dungeon Designer 3. Maybe I have to take a closer look at the Tome of Ultimate mapping to catch up on a thing or two. Getting all the different objects in the correct order in the map really gave me a slight headache. When you create a map in this style you really have to plan in what order to do things, if you don’t want to move things back and forth on the actual sheet. It took me some restarts of the map to get a hang on it. But once you understand the logic everything runs a lot smoother. The secret of success is to work from one of the top corners to the opposite lower corner. In this way you will naturally get the graphics in the right order and you don’t need to rearrange the order of the rooms and corridors all the time. When you reach that point everything also gets a lot more fun. I really enjoyed working with the style and the result gets so good that you just want to keep going, it’s just as addictive as playing a good computer game. However there was one thing I felt was very frustrating with the style, and that was that I want more! The style feels like a small taste of something that could be amazingly fantastic. I want circular rooms, walls with windows, more furniture, different floors, traps, outdoor environments, sewers and I could continue that list for another two posts. This is what Perspectives 3 (if it comes out) should look like. 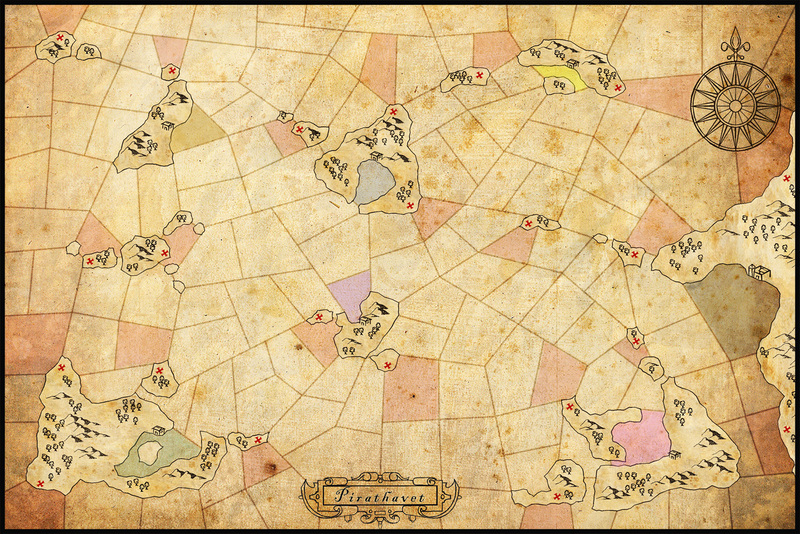 At the moment when the selection of different graphics isn’t too vast a lot of maps will turn out looking quite similar. So it is quite hard to do something unique with the style, but I’m hoping for a bright future and more isometric add-ons in future Annuals maybe. 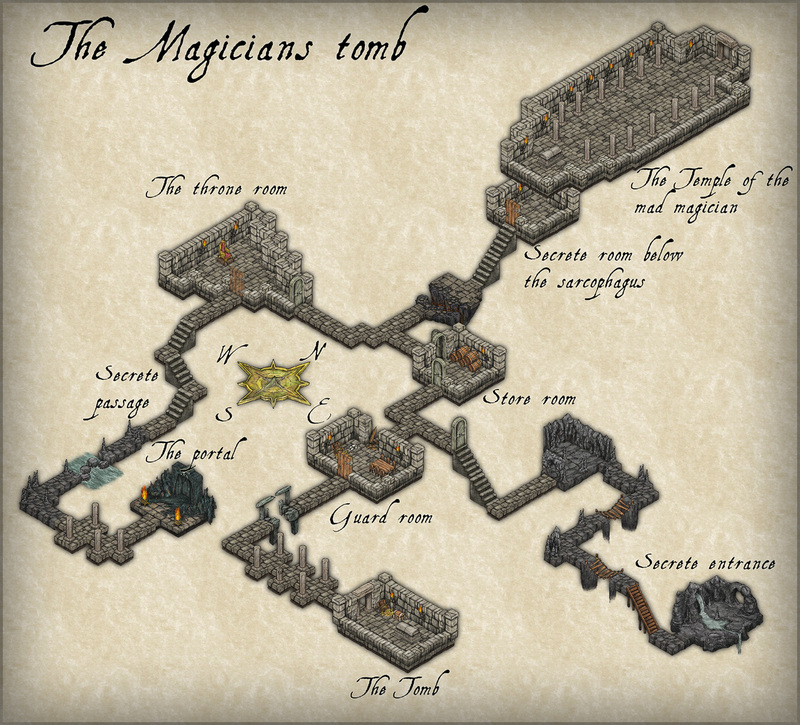 The map in the post is a small map of a temple to the mad magician and his hidden tomb beneath. Nothing spectacular but it will be great for an evening’s adventure with my kids.